Why is it called a press brake? At the beginning of the industrial revolution, stamping presses were developed. A machine and tool set meant to “stamp” the part from a sheet in a single stroke, both punching and forming operations. Energy or inertia is stored in a flywheel and when released this energy causes the ram to make one quick stroke, returning to the top dead center of the drive eccentric. With the concept of a press brake, a machine designed to make single straight line bends in sheet metal, it became quickly apparent that just releasing the stored energy was not going to work. The fast moving ram would just slam into the material, whipping the sheet metal part from the point of bend to the edge. 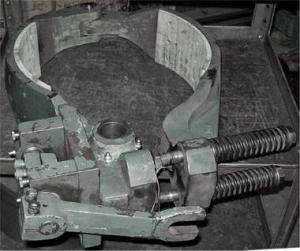 This in practice would produce nothing but injuries to the operator and damage to the press and tooling.That is why a brake was installed to the clutch and flywheel mechanism, figure 1. This allowed the press brake to be stopped just above the material thickness, the point we now refer to as the mute point. The modern mute point is set at .250-inches or less above the material thickness. Once stopped or slowed at the mute point, the inertia of the flywheel forms the material with the slow application of the power to the bend. The bed is located on top of the bottom plate and holds the bolster. The holds the die (lower tool) in the press brake. The ram is the part of this machine that does the moving. 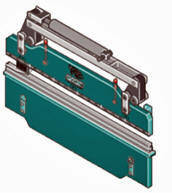 Side frame supports the ram and bed, and hold the machine together by bolting or welding. The Backgaugeis an adjustable back stop. 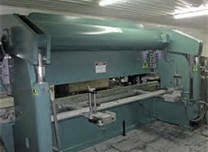 Hand adjusted on older machines and automated on modern CNC machines. applied to computer controlled press brakes. The Flywheel is a large weighted wheel which is spun to store the energy necessary to close and re-open a mechanical press brake. It has been replaced with hydraulic and electric drive systems. The Foot pedal is a mechanical switch used by the operator to engage the clutch or, start a movement in the system through hydraulics or electrical energy. The video courtesy of Trumpf Int., shows some of the different parts and pieces listed above are assembled to create a modern Press Brake. All makes and models of press brakes are, again, basically the same with the exception of a mechanical press brake which has a clutch and flywheel assembly for the drive system. There are several different types of press brakes discussed here, but, as noted before, they are made up from the same basic parts. The biggest difference is the drive mechanism: flywheel, hydraulic, hydro-mechanical and electric. The other difference is how they are controlled. The first type of truly “powered” press brake used the flywheel. The flywheel stored the power (inertia) that when released caused the motion in the ram. The “ram” is the moving part of this press brake, figures 2 and 3. While disengaged, the flywheel builds up the energy that when re-engaged, causes the ram to move up and down under full power. Full power is not necessarily the ram speed! The ram is always brought to the mute point .250-inches above the material thickness! Then, using the stored energy in the fly wheel, the punch and material is slowly forced into the die space. The mechanical press brake is one of the most dangerous of all the press brake designs. Operators can easily loose fingers or limbs for many of the following reasons: they move really fast and only in one direction; they have to complete the stroke and do not reverse direction (with aftermarket exceptions). They are normally capable of 150% of rated tonnage at the bottom of the stroke. Because of drift in the ram, an inherent issue between the brake and clutch timing. If the machine fails to complete the full machine stroke by reaching top dead center (TDC) or a little past, the ram will drift down toward the bed before the clutch assembly fully engages, figure 4. It is best practice to bring the ram all the way back to the Mute Point whenever possible. This creates a situation where the ram reverses direction in mid-stroke and possibly catching the operator off guard and ensnaring the workpiece, tools and/or body parts in the press brake. These accidents happen because the machine’s stopping “brake” was not kept in adjustment. This does not mean to say these machines were not capable of some top quality production. 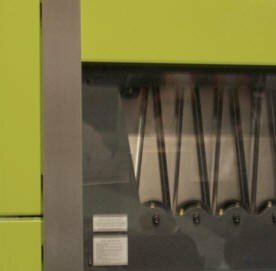 In the hands of a skilled operator, they can produce very high-quality parts; parts rivaling the quality of any press brake currently being manufactured anywhere. Nonetheless, the Mechanical Press Brakes are no match for the modern hydraulic or electric brakes for their speed, for accuracy or repeatability. The Hydro-Mechanical or Hydra-Mechanical press brake’s overall design is similar to that of the mechanical style press brake, the big difference is in the way that the ram is driven. Rather than a fly wheel, a hydraulic pump is employed. This hydraulic pressure drives a hydraulic motor which then turns an eccentric shaft, producing the necessary “up and down” action of the ram and the necessary power to make the bend, figure 5. The mechanical press brake had to complete a full stroke of the ram every time; the hydro-mechanical brake has the ability to limit its stroke. In other words, you could develop full tonnage at any point along the stroke and then return to the open position. “Open-height” is defined as the ram in its fully retracted position, and ‘Shut Height” is when the ram is closed to the limit of the stroke or the limit of a program’s called position. The hydro-mechanical allows a shut-height at any point above the bottom of the stroke and to then return to a preset open-height. Not only did the Hydro-mechanical press brake offer a vast improvement in machine capability and operation over the mechanical brake, it also offered a considerable improvement in safety. Every mechanical device must have clearance in order to have movement; clearance is necessary to allow the mechanism to function freely. For Hydro-Mechanicals this became a problem rather quickly. These machines were designed for light bottom bending and Air forming; but, as often happens, a new machine was purchased and installed. With age, use, and abuse, this clearance increases, sometimes dramatically, causing an ever increasing amount of play in the mechanism. Notice in Figure 7 that when the press is at rest the excess clearance or “play” is located on the bottom. When a load is applied during forming, the clearance moves to the top. Figure 7 illustrates this movement around the bushing and connecting rod for the ram. As you might imagine, this hurts the ram’s repeatability and can lead to vast swings in bend angle from one piece to the next, especially when air forming small parts. This is because you could be forming using only the weight of the ram rather than the power of the press brake. These bushings are no longer part of the drive train on modern press brake design, but that excess clearance certainly helped lead to the demise of this style of brake. 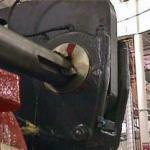 One the common presses used in working with heavy gauge materials is the Bell Crank press brake, figure 8. This brake design is capable of producing large tonnages. It is of particular value especially for coining or forming heavy gauge material. 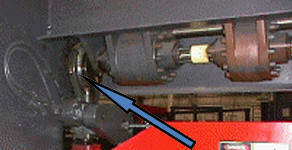 Set parallel to the ram the single hydraulic cylinder extends or retracts forcing the ram up or down. The mechanical advantage multiplies the power creating the larger tonnages required by heavy gauge material. However, accuracy and repeatability are sacrificed for this added power. 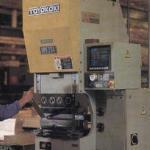 Pioneered by AccuPress Inc., the rocker style press, figure 9, dual cylinders connected to the frame rocking the assembly over a fulcrum point] providing power and accuracy to the far side of fulcrum point. The cylinders are tied together using a “torque tube” on the cylinder side of the fulcrum. This keeps the cylinders synchronized regardless of the flow of hydraulic oil. So, if one side of the press brake has load and the other does not, the ram cannot get out of parallel because of the torque. The modern hydraulic press brake uses a hydraulic pump and hydraulic cylinders to move the ram, figure 10. Unlike the previous press brakes that converted the hydraulic energy to mechanical energy, with the hydraulic motor fixed to an eccentric shaft. The modern down-acting press brake uses two hydraulic cylinders attached directly to the ram. There are many different hydraulic systems, from a single hydraulic pump driving both cylinders, or separate pumps. The pump can be straight forward or something like an “axial piston pump.” The hydraulic press brake can be further sub-divided into two basic sub-groups “up-acting” and “down-acting”. Hydraulic press brakes of this style represent 90% of all press brakes in use today. 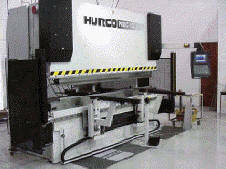 These machines are controlled by a CNC or DNC controllers (Computer Numerical Control or Direct Numerical Control). These DNC, CNC computers, in turn, control a proportional valve system for the hydraulics. 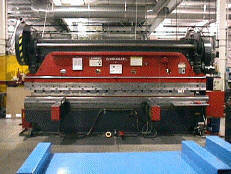 The French company Promocam Inc., was the first to perfect the up-acting style of the press brake. Up-acting is one of the better designs of the press brake, because of the ram’s guidance arrangement of rollers. Also, with the up-acting press brake, you have gravity on your side, working with you instead of against you as the hydro-mechanicals do; the clearance is always out of play. There are two different styles of electric press brakes: the direct drive and those that use a serpentine belt to increase tonnage. The direct drive versions of press brake use a ball and screw assembly to create the ram movement and to create tonnage. The tonnages are limited by the power of the electric motor, so direct drive machines tend to be relatively small. 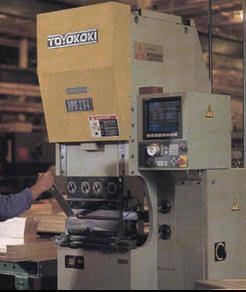 The Toyokoki press brake in figure 11 is a direct drive press. Note the electric press brake zeros or origins at the top of the ram stroke with all depth locations programmed down from there. The Toyokoki name is now part of the Amada LTD family. The second style uses a serpentine belt to increase the power of the electric motor as shown in figure 12. The drive belts are still driven by the accuracy of the electronic motor so the accuracy is within microns. 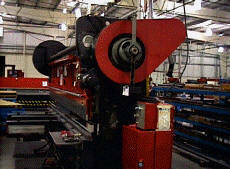 These machines are now getting into hundreds of tons of pressure through the use of these belts as multipliers. Generally speaking, electric press brakes have a smaller foot print, and generate little to no heat or noise as compared to a hydraulic. Except for daily maintenance, there are no oil reservoirs to check, no oils to clean. Either style of electric press brake has a repeatability in microns of an inch .000039-inches. What or how much is a micron? Reviewing the graphic in figure 13 you can see the relative difference in some detail. The large circle equals the diameter of the average human hair followed by .001 of an inch, .0001 of an inch, and a micron. Many modern hydraulic machines also repeat in microns. One of the newest drive systems is a hybrid, in press brake terms “servo-over-hydraulic”. These are driven by a new kind of hydraulic oil pump commonly referred to as an Axial Piston Pump; note there are other names for this style of pump. The axial piston pump uses a CNC controlled electric motor that spins a series of small pistons around a sloped surface with an equally controlled flat plate on top that directs the direction of the flow and the amount of fluid being moved. The video courtesy of Insane Hydraulics is not exactly like those used on some brands of press brake; nonetheless, it is a great little film presenting the idea behind this new pump.